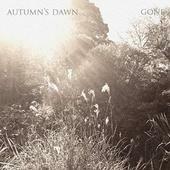 Autumn's Dawn are a band from Australia and they play Depressive Rock and Black Metal. I should mention that it's only two blokes pushing their sound here: Sorrow (drums, guitars and vocals) and Anguish (guitars and bass). They create some straight forward music, despite the Black Metal label. They have clean vocals on some tracks and traditional black metal vocals on others. It's an interesting approach since some bands stick with only one type of vocal delivery. Their music flows like standard rock although it has that gloom vibe going on most of the time; it still bends towards the depressive cliff more than not. There are guitar solos that are well-played and I found myself feeling a bit connected since I dug the solos above the brooding riffs. This is a new side project and the two members have extensive backgrounds with other bands (I'd tell you their names but that would just pull you from their clutches of doom and it's best to keep it contained and mysterious). There are nine tracks on "Gone" and each one stands on its own. The whole album has a good flow and doesn't disappoint. For more information, check out https://www.facebook.com/autumnsdawnband. Revised: 21 Feb 2016 12:36:08 -0500 .